A Baltimore Orioles blog. News, analysis, commentary on Major League Baseball, the Baltimore Orioles, American Culture and whatever comes to mind. Impressed with Orioles Moves So Far This Off-Season? We’re about halfway through the offseason and the notion amongst fans, along with the media is that the Baltimore Orioles have not done much to improve their roster. The Orioles, as we all know, had an impressive 2012 season that culminated in their first playoff berth in over 15 years. One would have thought that the organization would have found another bat, plus perhaps another arm to bolster a team that has a strong core with players like Adam Jones, Matt Wieters, J.J. Hardy and Nick Markakis. Aside from re-signing Nate McLouth and finding guys such as pitchers Daniel Schlereth and Zach Braddock along with first-baseman Travis Ishikawa, the Orioles need to do more. The local media have said from day one of the off-season that the Orioles would not have any high-dollar signings such as a Zack Grienke and Josh Hamilton based on their sources. I would like the organization to take a shot on someone; however, it seems like the Orioles want to get pieces they want via trade. There’s still quite a bit of time before Spring Training kicks off in February. Remember, Dan Duquette waited until last January to make some moves and many of them, such as trading for pitcher Jason Hammel worked out. However, my fear – along with most fans – is that the Orioles are due for a regression in 2013. A few of their rivals in the American League East – such as the Boston Red Sox, and more notably the Toronto Blue Jays – have made tremendous moves; meanwhile, while the New York Yankees are still old, seem to want to hold onto their cash, and have problems offensively, their pitching rotation is still intact and strong. The Tampa Bay Rays perhaps took a step back in trading James Shields and Wade Davis for Will Myers and some prospects this winter, the brain trust of that organization is top rate. Furthermore, they still have a talented pitching staff despite their offensive problems. In addition, although they will never win the checkbook championships, their signing of Evan Longoria to an extension was shrewd and manager Joe Maddon seems to always get the best out of his players. The kickoff to the 2013 baseball season will begin on Saturday, January 19, as the Orioles host their annual FanFest event at the Baltimore Convention Center. 2013 FanFest, presented by Visit Sarasota County, will feature appearances by current and former Orioles players and coaches as part of a day-long celebration of baseball that will also include clinics, exhibits and interactive games. The event will be held from 11:00 a.m. to 6:00 p.m., with early entry for Orioles Season Plan Holders to begin at 10:00 a.m. as part of the Orange Carpet Program. Tickets for FanFest will go on sale at 10:00 a.m. today and will be available online at www.orioles.com/fanfest, via phone at 1-888-848-BIRD or at the Oriole Park Box Office and at the Official Team Store at the York Galleria in York, PA. Tickets are $10 for adults and $5 for children 14 and under and those over 55. On the day of the event, FanFest tickets will be sold at the Convention Center and the Oriole Park Box Office. 2012 Season Plan Holders, those that have made deposits for 2013 season tickets, and Dugout Club members will all receive complimentary tickets to FanFest. According to CBS Sports' Jon Heyman, Mark Reynolds has signed a one-year deal with the Cleveland Indians for $6 million. This was also reported by the Baltimore Sun last night. Should we be devastated? Not really. Reynolds seemed to be a good guy, play hard and played some very good first base after being moved from third; however, the Orioles didn’t seem to want him. I would think Reynolds’ bat was a big problem with the decision-makers in the organization. At times, he could hit homers in bunches (notably against the Yankees), but one could count on him to have a low batting average, strike out a ton and walk a bit. 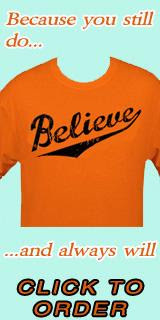 It has been said many times, many ways that the 2012 season for the Baltimore Orioles was improbable at best. By going 29-9 in one-run games the Orioles accomplished something that no team in recent history has ever been able to pull off. This either meant that the O’s were supremely, irrationally, lucky or there was something else going on that the now stat-crazed MLB establishment just couldn’t put their fingers on. Whether it was luck or some kind of byzantine skill a team that was widely picked to lose 100 games last year won 93 and took the endless New York Yankees to game five of the ALCS. Now, can they do it again? Normally when a team wins 93 games there is a sense of certainty surrounding the club the following year. There is a sense that, all things being equal, similar results should come for the new season. That cannot be said for the Orioles. Given the unnatural progress they made last year the baseball elites are still looking at the Orioles with a sideways glance trying to find the mirrors through the smoke. The Orioles are sitting at a major turning point right now, do they stick with the formula that worked, buy the big free agents, or make the big trades? General Manager Dan Duquette stated yesterday that he is “happy” with the current roster, though he is still looking to make deals and improve the team. For all intents and purposes it appears that manager Buck Showalter is fine standing pat as well. 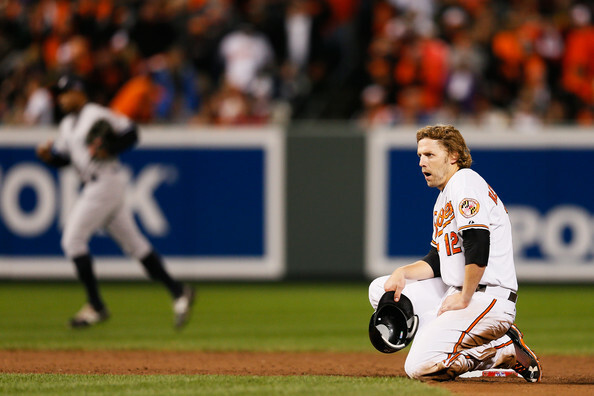 The Orioles did lose Mark Reynolds after the team decided to non-tender him. While Chris Davis would be able to return to his natural position at first, and Manny Machado would be the opening day third baseman, that does leave a rather large hole at DH. Reynolds definitely did not have his power-stroke for much of the 2012 campaign which is most likely the reason the Orioles let him go. But without his bat in the lineup what would a DH look like with the current roster? The primary candidate would be Wilson Betemit. When Betemit was signed last year it was assumed that this would be his primary role but injuries and the ineffectiveness by others forced him into the field much more than I believe was originally intended. Betemit gets on base at an average clip, roughly the .330’s, but nothing astonishing. He still has some power, though coming off a surgically repaired wrist it will be interesting to see how he recovers. Betemit is not an ideal DH, frankly I always thought Mark Reynolds was a more prototypical DH but that ship seems to have sailed, but Betemit has the ability to fill the role in a respectable level. The wild card in this is Nolan Reimold. Reimold is a fan favorite. The oft’ injured Reimold has shown flashes of dominance in parts of three seasons with Baltimore. Last season was, again, cut short with a season ending-neck injury. Reimold is primarily a left-fielder, but with the re-signing of Nate McLouth Reimold should logically be pushed into the DH role. He was off to an absolutely torrid start in 2012, but only played in 13 games all year. As much as everyone wants to see Reimold pick up right where he left off last year I don’t think the Orioles can rely on him in any tangible way. The rest of the Orioles roster does not seem to have a real DH bat on it beyond those two. Needless to say, while standing pat might not be the worst option in the world, the Orioles will be missing a big bat in the middle of the lineup. That is unless Nolan Reimold can come back strong and stay healthy. The Orioles today announced that Holiday 5-Packs will go on sale Monday, December 10 at 10:00 a.m. through www.orioles.com. 5-Packs include a ticket to Opening Day, plus vouchers for four additional games that can be redeemed for an Upper Box ticket to any non-prime games in April and May. Each five-game package costs $110, plus fees, and includes a complimentary ticket to 2013 FanFest with purchase. There is a limited quantity available, and packages are expected to sell out quickly. Should we as fans be upset at what the Orioles did at the Winter Meetings? The biggest signing that they had was bringing back Nate McLouth for a one-year pact. They also got a pitcher in the Rule 5 Draft, T.J. McFarland, and Dan Duquette did a lot of talking, mainly noting that the franchise has a good to core to work with. In Nashville, many fans had wanted the franchise to be bold and open up the purse strings and perhaps make Christmas in Birdland a memorable by reeling in Josh Hamilton, Zack Grienke, or any big name free agent you can think of. Yes, the Orioles were fairly quiet in Nashville. I thought that Duquette could have done more this week; however, with the prices that some players – notably Angel Pagan, Macro Scutaro, and the Eric Chavez’s of the world –went for, perhaps it was a good thing that the Orioles didn’t go crazy and get a player for the sake of signing one. I certainly think that the Orioles need to upgrade the roster, because honestly, what happened last season was a tad fluky – especially with their record in one run games and in extra frames. They cannot stand pat with the team as-is, but at the same time, Duquette has shown himself to be adept at finding diamonds in the rough, players of value who fit a certain role, and taking chances on those who have been overlooked. The weather is getting colder and we in Baltimore are staring down December awaiting snow, the Mayan apocalypse and the approach of Nimburu; although only one of those is likely to happen. And if that opening sentence wasn’t evidence enough the offseason has been rather boring so far for the Orioles. Yes, they picked up Alexi Casilla and traded Robert Andino but the electrons that have been spent on those two moves already total too much. There just isn’t much to talk about regarding the Orioles right now. There are rumors and rumblings, whispers in the dark of names like “Hamilton” and “Greinke,” but largely for an enterprising blogger to sink their teeth into. SO let’s take a, very early, look at the AL East and what could happen in the coming months. The Yankees are older, streakier and weighed down by massive contracts and commitments to legendary players. But they are also one word that I have used to describe them before: Endless. They simply have no end, they are always there and someone always comes back, has an inexplicable season or a deal is made to propel the Yankees to where they are accustomed. 2013 will see the Yankees dealing with the looming awful of Alex Rodriguez’ horrendous contract, Derek Jeter’s ever diminishing ability to field, a massive hole at catcher and right-field and another hole in the rotation is Andy Pettite decides to re-retire. Still, they won 95 games last year. Still, they won the American League East. Still they went to the ALCS. The Yankees are in a weird position this offseason. They may have finally reached the bottom of the money pit. With the financial albatrosses of A-Rod, CC and Tex hanging around the team’s neck they don’t look to be much of a player in the high-priced free agent market. BJ Upton has not been linked to the bombers, nor has Josh Hamilton. Still the Yankees will find a way to shore up the team before 2013 and as much I would love to think that the particularly feckless playoff performance the Yankees produced is a sign of things to come there is little reason to think the Yankees won’t win 90 games next year. Sure, the age could finally catch up with this team and the keg of Yankee-majesty could finally tap out bringing them back to the realm of more mortal squads but until it actually happens you can’t simply assume that it will. I really shouldn’t take as much pleasure in the collapse of the Red Sox as I have. I mean I really shouldn’t – but I do. It wasn’t always like this. There was a time at the peak of New York Yankee hegemony where I felt a kinship with Red Sox nation. I rooted hard for the Sox every time they played the Yanks. Then something shifted in “the nation,” at some point the fans that began to invade Camden Yards became the most insufferable group of malcontents that I have ever experienced. Then they won the World Series a couple time and became completely unbearable. That is why 162-2011 was such an amazing moment for Baltimore fans. If you haven’t been here for that long you don’t get it, you can’t get it. So watching last year’s systematic destruction of the Boston Red Sox warmed my soul. That being said the Red Sox are in trouble. The AL East is shaping up to easily be the most competitive division in the American League. With the Yankees aging and the Red Sox looking weak for the foreseeable future the power in the American League looks to be moving out west. I think it is very likely that the top two records in the AL are coming out of the west, especially seeing how the Rangers and Angels will get to beat up on the Astros for a year. With the former powers stepping back the rest of the AL East by default takes a step forward. The Orioles proved that last year with their improbable run. Going into 2013 the world is different and the AL East will be a slugfest, mostly because of massive changes north of the border. But first, The Tampa Bay Rays. The Rays finally showed they are willing to spend money and commit long-term to the face of their franchise, third baseman Evan Longoria. And it is a great thing for that franchise. The Rays have spent the better part of their existence as a minor league outfit for the rest of the major league. The cash-strapped Rays simply have not been able to lock up their star players they develop, Longoria changes that. But with one locked up another is lost as the Rays’ center fielder BJ Upton left for greener pastures in Atlanta. One can argue the worth of Upton, a player who never really took the next step in his career with Tampa, but the Rays simply can’t afford to lose offense. With Longoria out the Rays’ offense took a nosedive last season and it showed in their inability to make it to the playoffs at the end of last season. Through May, June, and July the Rays (as a team) failed to bat over .680 OPS (.676, .642, .662) and in two of those months they barely got on base at a higher than .300 clip. The Rays have the arms, there is no doubt about that. Hell, anyone who has followed baseball over the last five years knows that the Rays simply do nothing else other than produce amazing pitching talent. It is that pitching talent that will carry the Rays and serve as the foundation for their franchise’s continued success. To augment that pitching the Rays will most certainly be looking to improve their offense. To do that the Rays will most likely have to deal from their core of young pitching. Still, a down Rays team barely missed the playoffs and won 90 games last season. Unless they make big moves this winter, and they go badly – which is rare for the Rays, there is no reason to expect them to be significantly different next year. This week, the annual MLB Winter Meetings will be taking place in Nashville, Tennessee. Once again, fans and the baseball world are looking forward to what happens. The Orioles, as we all know, flew high during the 2012 season, winning 93 games, regaining a fan base and delivering a world of possibilities that few could have dreamed of. Now that we are in December, the Orioles have to do more with their roster if they plan to win again like they did in 2012. The organization has a good core of players at the major league level and the minor league system looks to be improved – somewhat; however, team needs a bat and perhaps another arm despite the success of a patchwork rotation and diamonds in the rough like Miguel Gonzalez, plus the emergence of Chris Tillman. The Red Sox and Blue Jays are retooling, but what are the Orioles planning to do? Quite a few players will be getting raises either through their contracts, or arbitration, so the payroll will probably be going up. Then again, will the team rebuild through trades, or make a splash on the market. We all know that Mark Reynolds was not tendered a contract by the Orioles and is a free agent. While he did come through big at the end of the summer at the plate, and also defensive at first base – frankly, he is not worth $9 million. While I like his grit, the Orioles could do much better on the market, or spread the money between multiple players. He could be re-signed at a lower rate, but I’d personally like to see the team get a much more productive hitter before even re-considering Reynolds for 2012. We have top views at Orioles, games, plus a loaded NFL, schedule. Check these tix to Dallas Cowboys, Pittsburgh Steelers, Atlanta Falcons, New England Patriots and Denver Broncos. The top gambling sites offer sports betting, poker and casino games from one account. In most cases, you won’t even need to download the software as most betting sites have slots no download. JUGS Sports is the leading producer of pitching machines and batting cages trusted by professional and amateur athletes as well as coaches worldwide. Get information and help regarding your Gambling Addiction from poker, roulette and blackjack rehabbed players! If you love the Hockey, you must also Love The Baseball. Are you a gamer? Do you like to play Poker, Roulette & Black-Jack? At Gamer Play you will get the information on how to be a true gamer. AllianceTickets.com has cheap MLB Tickets including Baltimore Orioles Tickets, Colorado Rockies Tickets, and San Francisco Giants Tickets. Check them out for all your discounted ticket needs. MyTicketIn.com is your Houston Tickets Brocker offering Boston Red Sox Tickets, New York Yankees Tickets, Chicago Cubs Tickets & Los Angeles Dodgers Tickets at discounted prices. Being that I am online a lot, I like nothing more than to recieve mail. Press Box - Baltimore Sports. Period. Cookin’ With Gas - Statistical analysis of the Baltimore Orioles on an almost weekly basis. Only Baseball Matters - A Giants Blog.